Q. Do the children in Love A Child schools receive a Christian education? Yes, every child in our sponsorship program receives a Christian education taught by government certified Christian teachers. Q. How do I communicate with my child? Sponsors can write to their sponsored children using one of our Translated Letter Forms that are provided in the initial Child Information Packet. If you would like more forms, please contact our office by phone or email and we will be happy to send you more. You are also welcome to make copies of the form. Q. Can I send my child gifts? 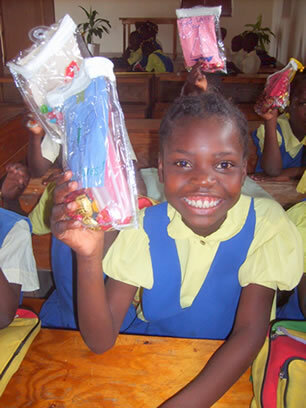 Sponsors can send their child a gift package once a year. Details on how to create a gift package are included in the sponsorship packet, or a gift pack can be sent on your behalf to your child with a $30 donation by clicking here https://loveachild.com/send-a-child-a-gift/. Q. How can I expect to hear from my child? The children love your letters and it lets them know that someone else cares about their future; however, please keep in mind that sponsorship is not a pen pal program. You will be mailed updates periodically including, artwork, letters, and photo updates as your child’s school completes them. Q. How long can I sponsor my child? The children in Love A Child Schools stay in the Child Sponsorship Program until they graduate 6th grade. Once your child graduates, you will be notified and sent information introducing you to a new child who needs a sponsor. Q. What if my child moves away? We try our very best to stay in close contact with each child. If for any reason, your child leaves our school system, your gifts will continue to be combined with the funds from other sponsors to help care for other disadvantaged children in our program. We will then send information introducing you to your newly assigned child. There are always children waiting and hoping for a caring sponsor. Q. May I visit my child? You can meet your child provided that you are participating in and traveling with one of our missions trips. The schedule is available here (https://loveachild.com/mission-teams-to-haiti-and-the-dominican-republic/) and you may contact us with further questions. CLICK HERE TO SPONSOR A CHILD IN NEED TODAY! Please contact the LAC Sponsorship Department at 239-210-6107 for further questions. Your monthly support is combined with the gifts of other sponsors to provide for the needs of our sponsored children. Should your child leave our Love A Child Sponsorship program due to the effects of a natural disaster, or any other economic, social or cultural reason, your gift will continue to be combined with other Love A Child sponsor gifts to help care for other disadvantaged children within our program.